With a modern design and intuitive layout, the SightChek™ Digital Phoroptor® features the precise refraction readings you need combined with an exceptional user experience that will take your efficiency to the next level. Designed for maximum efficiency that allows you to rapidly perform all of the functions of a manual Phoroptor®, all while comfortably seated next to your patient. Effortlessly access all tests and settings through the intuitive user interface on the 10-inch tilting touchscreen. 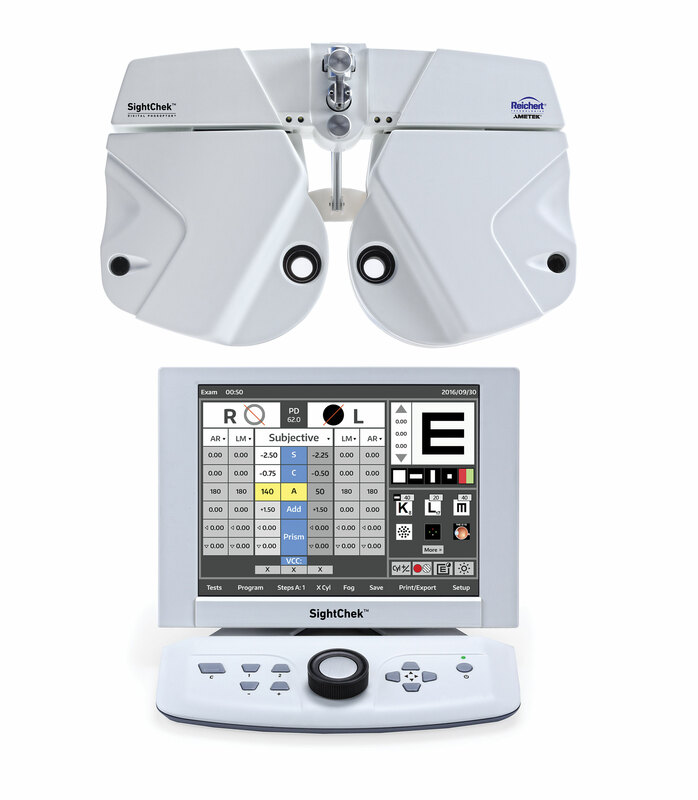 Lenses are quickly exchanged using the central control knob, helping to minimize patient eye fatigue. A Full Range of Guided Tests. Easily perform programmed guided tests such as Phoria, Fused Cross Cylinder, and Binocular Balance. Near Vision Testing Made Easy. Automatic convergence, auto-illuminating near vision light source, and a detachable near vision rod and card are available for maximum efficiency in near vision testing. Adjusting cylinder power and axis can be completed using the traditional Jackson Cross Cylinder or Split Cross Cylinder for fast, convenient, and accurate astigmatic testing. Easily create your own refraction sequences using up to 3 customizable programs to increase total practice efficiency. 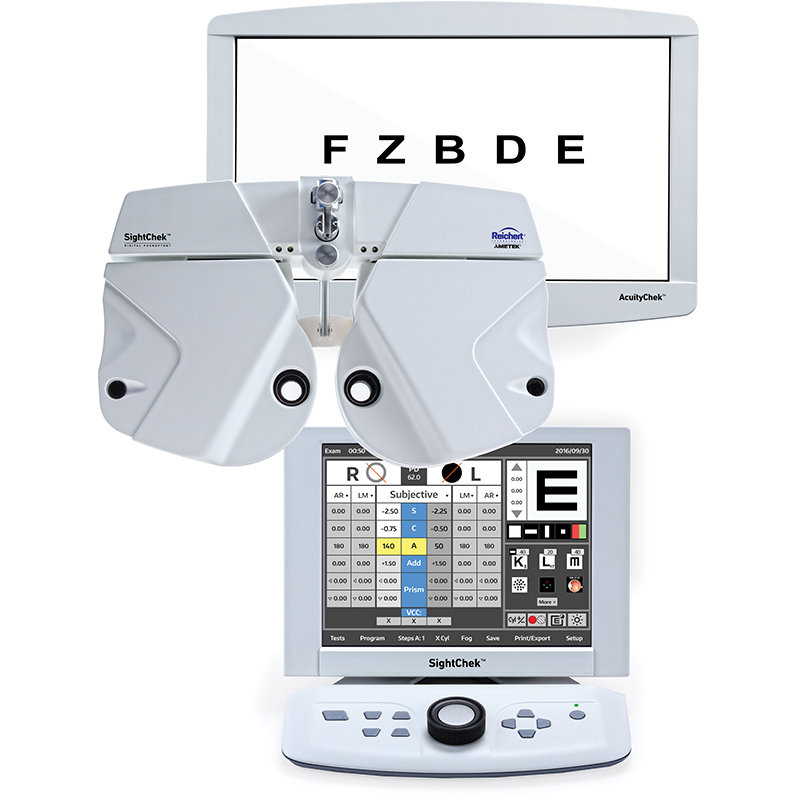 Connect multiple SightChek™ Digital Phoroptors and Reichert® pre-test instruments for a completely connected office. The Best Possible Patient Care. Integrate with EMR systems, removing risk of transcription error and increasing throughput.